Linda Mwale, legislature secretary and Thandi Shongwe, former speaker of the legislature in happier times. A brave Johannesburg businessperson refused R5 million in exchange to being part of an arranged “joint venture” to siphon money from the Mpumalanga provincial legislature. The owner of Sarafusion (PTY) LTD, known only as Mr B Musaruwa, is an expert in the SAP software system. He had provided SAP maintenance and support for the legislature on short contracts renewable every three months. But this ended abruptly in 2017 when his company won a three-year tender that the legislature had advertised for the same service. Sarafusion’s successful bid was R15 million, but to his surprise, the appointment letter signed by Legislature secretary, Linda Mwale, was R5,5 million more. That was not all. The name of his company had also changed. It was now called Sarafusion (PTY) LTD JV Frugacode. When he enquired about the name change, a senior official in the legislature told him that a Sarafusion employee had signed an agreement on his behalf to form the “joint venture” with a company called Frugacode. This angered Musaruwa and he argued that only he, as the director of Sarafusion, can consent to a joint venture. “He asked what Frugacode was bringing to the table, but the legislature could not budge. When he insisted on getting answers, the legislature reminded him that his bid was R15 million and as a “joint venture” they’d be getting R20 million,” said a source who is close to Musaruwa who spoke on condition of anonymity. The source said that talks reached a breaking point when the legislature told Musaruwa that Fugacode would be the company that issues invoices and the money that the legislature pays would be deposited in Frugacode’s bank account. “He told them in no uncertain terms that he would have no legal standing if Frugacode fails to pay him for the work. He rejected the offer, even with the “free” R5 million and as a matter of principle, he chose to forego a tender that he had won fairly,” said the source. 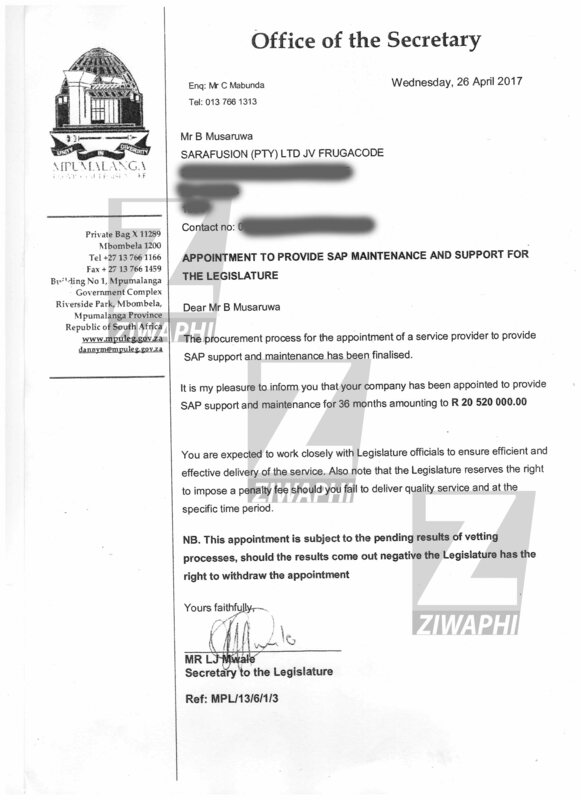 In this edition of Ziwaphi, we publish the appointment letter, for the first time, that corroborates the source’s story. It shows the name of Musaruwa’s company, Sarafusion (PTY) LTD alongside that of Frugacode, even though Frugacode did not tender for the work. Following his refusal to participate in the scam, Musaruwa started receiving death threats that he should no longer set his foot in Mpumalanga. They told him that in Mpumalanga people die and the cases disappear, said the source. The free R5 million letter signed by Legislature secretary. The legislature had to readvertise the tender for the third time instead of awarding it to the winning bidder. Ziwaphi tried unsuccessfully to reach Musaruwa. Ziwaphi also called the Frugacode cell phone number, but a woman who answered hung up after this journalist introduced himself, and she never picked it up again. This journalist nonetheless, sent questions through SMS and through Whatsapp. While it shows that she had read the questions, but she still failed to respond. 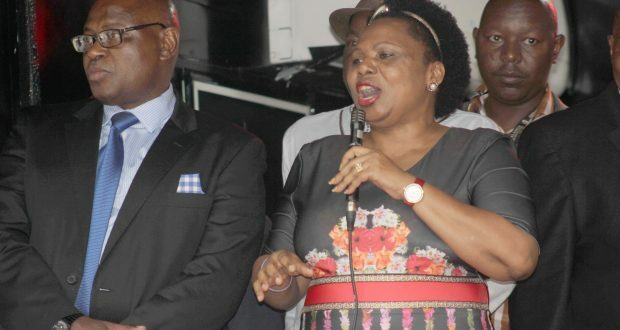 Last week, the leader of the Economic Freedom Fighters, Collen Sedibe, opened a fraud case against Mwale and former speaker of the Mpumalanga provincial legislature, Thandi Shongwe after the legislature awarded the same SAP tender to the same company, Frugacode even though the company did not reach all the requirements. A leaked report from the Auditor-General shows that the legislature awarded the contract to Frugacode in September 2016 for R19,5 million while the company did not have SAP software systems accreditation, which was one of the mandatory requirements. The only difference this time is that Frugacode was the company that tendered, using the SAP accreditation certificate that belongs to a company called Lejaro Global Solutions. “As the advert or mandatory bid document did not indicate that the certificate of other entities could be used, other prospective bidders would not have been fully aware that responsiveness would have been considered if the SAP accreditation certificate was issued in the name of another entity. Therefore, the process is unfair as the fact that SAP accreditation certificates not issued in the prospective bidders own name could be used was not common knowledge and was not clearly stipulated in the advert or bid document, thereby preventing prospective bidders from bidding,” reads the report written by Kethan Ramith from the Auditor-General’s office in Mpumalanga. A further investigation by Ziwaphi revealed that the person behind Frugacode is a Happy Nxumalo, though the company is not registered in her name, but in the name of a Thabiso Jacques Mathebula. In 2017, Ziwaphi published a story where Frugacode benefited from an irregular expenditure estimated at over R30 million from the department of culture, sports and recreation for the installation of Radio Frequency Identification (RFID) system in all Mpumalanga libraries. An investigation by Ziwaphi found that the system was never installed, even though the company had already been paid more than R10 million in the first year, while the tender was for R4,9 million over a period of three years. That story led to the resignation of the disgraced former head of department for culture, sports and recreation, Walter Mnisi, after he failed to get a condonation from provincial treasury for the expenditure. A source within the department of culture, sports and recreation told Ziwaphi that Frugacode continues to benefit from the contract even long after Mnisi had left. A Ziwaphi investigation discovered that Frugacode also shares an office space with a company called Junox 210 CC and that Nxumalo is also a contact person for both companies. The Auditor-General fingered Junox for benefiting from an irregularly issued tender for the provision of multifunctional photocopiers to the legislature. According to the AG report, Junox was one of 13 companies that tendered. The legislature disqualified the other 12 companies because they submitted certified copies of their tax clearance certificates instead of the original documents, but the legislature awarded the contract to Junox even though the company also failed to submit an original tax clearance certificate, but a printed copy from the SARS efiling facility. “None of the prospective bidders met the mandatory requirement of submitting an original valid tax clearance certificate, however Junox 210 CC was not declared as being (unresponsive)” reads the report. The AG also found that Lowveld Office Automation which had quoted only R1 949 400 was supposed to have been awarded the tender instead of Junox 210 CC which had quoted R9 828 438.54. “Therefore the bid (was) awarded to the wrong bidder as the disqualification of the two prospective suppliers who did not submit original tax clearance certificates is unfair,” reads the report. Another irregularity that the AG’s office found was that the legislature failed to adhere to the Supply Chain Regulations of the Financial Management of Parliament and Provincial Legislatures Act which requires that if a tender price is not market related the tender may not be awarded. “Prior to an award being made, the accounting officer should assess if the price offered by the tenderer is market related so as to comply with the preferential procurement regulations. An ability to test the reasonableness of the amount awarded to the relevant market should be incorporated into the bidding process to give effect to the value for money principle included in the SCM Regulations,” reads the report. The AG however found that the budget for the project was R8 000 000 against the award to the winning supplier which was R9 828 438.54. Another damning finding was that Junox 210 CC was awarded the contract even though its price was an average of 40% more than the other companies. “The average price of the disqualified suppliers was 40% lower the the winning supplier with the lowest supplier being 25% (4 times) lower. Legislature spokesperson, Zamagambu Memela-Gamede declined to respond to written questions. She said that the legislature would await the police investigations on the awarding of the SAP tender. PS: The day before the printed version of this article was printed, a lawyer from Du Toit and Smuts Attorneys in Nelspruit, who claimed to be representing Happy Nxumalo, the person behind Frugacode and Junox threatened this journalist with a defamation suit if the name of her client and her companies were mentioned in the article, even though her client had been given an opportunity to respond. The newspaper however, published as scheduled. Previously, Legislature secretary, Linda Mwale and former Speaker Thandi Shongwe had tried unsuccessfully to sue this journalist after he exposed the irregular issuing of contracts and a cover-up on a sexual harassment case that one of the employees had opened against a general manager in the legislature. The employee was removed from her position and transferred into a post with better benefits. This was after she allegedly blackmailed Mwale by threatening to expose the issue in the media. She was later demoted, but she still retains all the benefits of the position.